Cast: No-one anyone's heard of: Nathan Meister, Danielle Mason, Peter Feeney. Directed by Jonathan King (not that one). 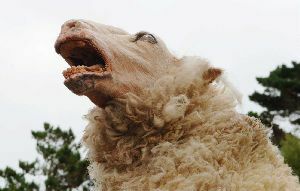 Story: Zombie sheep. The Violence of the Lambs. Ah, a zombie sheep comedy horror - does a week ever go by without one? Black Sheep is the best one I've seen since last Tuesday. At least. Black Sheep is a low-budget New Zealand affair, featuring animatronic sheep terrorising the locals after being infected with a genetic virusy thing. There's something naturally comical about sheep, so seeing them transformed into snarling woolly beasts is rather entertaining, especially when it's combined with the level of gore that makes you actively wince at the screen. Infected sheep chew bits off people, infected people tear strips off sheep, it's a sinewy mess of the special effects department's goo - and there's no CGI here, it's all done for real, apparently by the same guys who did the beasties for Lord of the Rings - though they never look particularly sheepy. Your enjoyment of Black Sheep rests solely on whether or not you buy into the daft humour. I watched a movie some years ago called I Bought A Vampire Motorcycle, featuring a still floppy-haired Neil Morrissey and a possessed Norton Commando. I loved it, but one particular buddy of mine couldn't even sit through it until the end, because it was so ludicrous. Jonathan, if you're reading this, don't go and see Black Sheep, you'll hate it. However, if you do tend to titter at the absurd and can tolerate some outrageously overblown ovine escapades, give it a go ... when it comes out on DVD. No point in seeing this on the big screen when Stardust and Ratatouille are showing at the same time! Black Sheep is a cult thing - you either lap up the daftness or are turned off by it. Get bevvied up beforehand and go with a group of like-minded loonies and you'll have a whale of a time - or go with your strait-laced mother-in-law and prepare for pain. Testosterone Satisfaction Rating: 3/5 - some comically graphic gore. To enjoy this film you should be: in a silly mood. Black Sheep was released in the UK on 12th October 2007.